Harry Potter Fan Zone, along with a number of other fan sites, recently had the chance to speak with Dan Radcliffe. I asked Dan about the most physically and emotionally challenging scenes in Harry Potter and the Deathly Hallows. Harry Potter Fan Zone: What would you say [was] the most challenging scene to film physically and then the most challenging emotionally in this film? 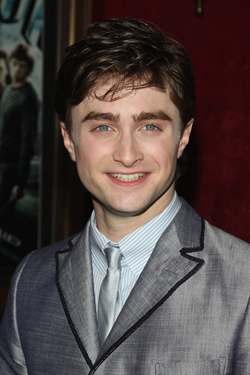 Dan Radcliffe: Physically? The underwater stuff is always pretty tricky and in this case it was particularly tricky. I’m going under into the frozen lake to get the Sword of Gryffindor and the Horcrux is fighting for its existence and is trying to kill me. We do what will hopefully be a pretty terrifying almost semi-homage to The Omen where I get dragged up against the surface of the ice and torn around by the locket. That was pretty challenging. Emotionally? All the stuff early on in the film with Rupert. It’s very, very hard to hate Rupert Grint, even in performance terms. That was a challenge but hopefully some really, really good scenes will come out of it. Also all the scenes in Godric’s Hollow where Harry sees his parents’ tombstone. They were obviously big emotional moments. Harry being such a battle-hardened, almost desensitised person at this stage, is dealing with emotions which he doesn’t know how to show because he’s buried emotions for so long. That’s how he’s managed to survive and keep his sanity: by ignoring, a lot of the time, his tragic past and how he feels about it. So to combine the natural grief one would feel at that moment with the kind of stoicism that Harry has developed over the last year, that was a challenge, but one I thoroughly enjoyed.